Example of a Somatic session with Nazbah Tom from Nazbah Tom on Vimeo. 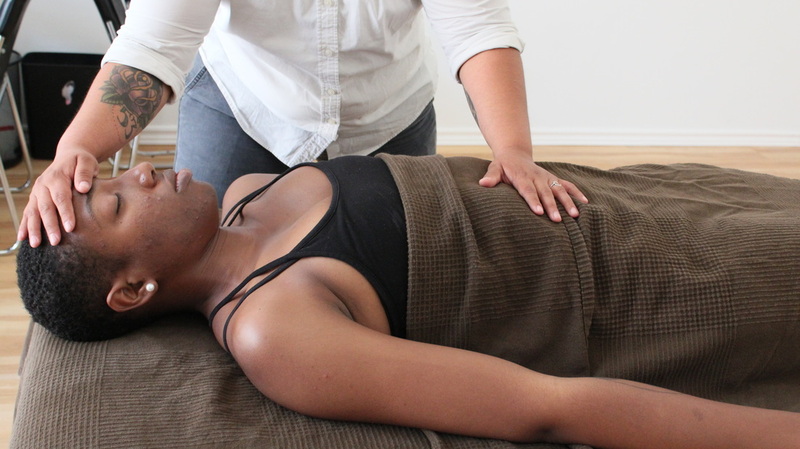 Somatic bodywork uses conversation, touch, breath, gesture, and practice to move the mind/body/spirit from a historically conditioned "shape" to one that is aligned with the person's visions and goals. One's current "shape" is the sum of a person's lived experience up until now. This includes the body they were born into, the memories, the wounds, hopes and dreams that the body holds. Family. Society. Institutions. Systems. Landscapes. History of one's community. These elements have literally physically shaped, moulded the person's identity, relationship to others and how they negotiate the world that they live in. People generally know what is working and not working about their historical shape, and it's the ways in which it is not working in their relationship to self, others, and the world that they want to change and shift. let the transformation begin here. Individuals often present to this work at a juncture in their life where change is occurring, there is a transition happening, and they are unable to sustain their lives in the ways they have known. There is a strong desire to try something else, to involve more of who they are in to the work, and to be seen and held in such a way that they feel met, honored, believed, and challenged. Somatics, then, serves as a holistic, integrated, and embodied approach toward transformation work with individuals and groups. It considers the mind, body, and spirit as a whole entity that moves together towards change and transformation. Western psychotherapy considers the cognitive processes first and foremost in its orientation with the body and spirit as auxiliary pieces to attend to separately. Somatics puts forth that the whole of a person in their history, present shape, and future goals are as connected as the mind, body, and spirit of that person. what might the transformation look like? Each person's path of transformation is unique inside of somatics work, yet the underlying factors are similar in that we all have bodies which have been shaped by the world. Somatics invites the person or group to continually return to the present moment, to connect with what they care about, and to learn how they have been shaped by the world. Somatics does this with gentle but rigorous and loving intention. One avenue of connecting with the body is through the breath. An elder, Mona Stonefish, once mentioned that the only thing we have control over is our breath. Somatic awareness, somatic opening, and somatic practices combined inside of a complex social context that that person is negotiating offers each person a holistic approach toward their transformation. * Somatic awareness has the person using the body and sensations as information and a resource towards beginning to understand what they care about and what they want to transform. A practice to introduce to someone inside of this is a meditation practice that invites the person to track their sensations. * Inside of somatic opening, the person comes to understand that their bodies hold a history of shaping, stories held inside of muscles, and contractions that have dictated how that person walks through the world. Somatic opening aims to have the person feel emotions that are difficult, to de-armor the person, and let go of stories that no longer serve them. Transformation is done through the body rather than through cognitive insights, this produces a more rooted and long lasting transformation for the person. Somatic bodywork comes in as a profoundly effective practice to support openings in the body in a way that talk therapy is not able to. * Somatic practices are often times newer practices such as trusting, boundary setting, and receiving and giving, that were not developed due to the body taking care of survival needs and holding survival strategies as more important to the safety and well being of the person than anything else. Along with these practices we want to make sure the person's sense of safety and connection to self as well as their partner(s), family (self defined), community, and spirit/landscape is cultivated in such a way that it aligns with the person in a sustainable way. Somatics orients towards advocating for the person's well being in such a way that what they care about, their new commitments, and new practices they are integrating is aligned with their values. We can see transformation as a learning about the safety shape that has preserved a person, learning new skills to understand where contractions prohibit breath, life, and movement in the body, and letting go of ways of being that no longer work for the person. There is an emotionally intimate exchange inside of a trusting and safe partnership with the somatic practitioner where the person honors how their body, mind, and spirit shaped itself to get through traumas they have endured to a more open, present, and connected self that feels more alive, is able to build deeper and more nourishing relationships, take more effective actions, and to be more yourself. *All examples of body work performed on willing models, Kayla Carter and Chanelle Gallant and documented by permission.